There’s a Big Misconception out there about e-Learning, and its sell-by date has passed this long since. 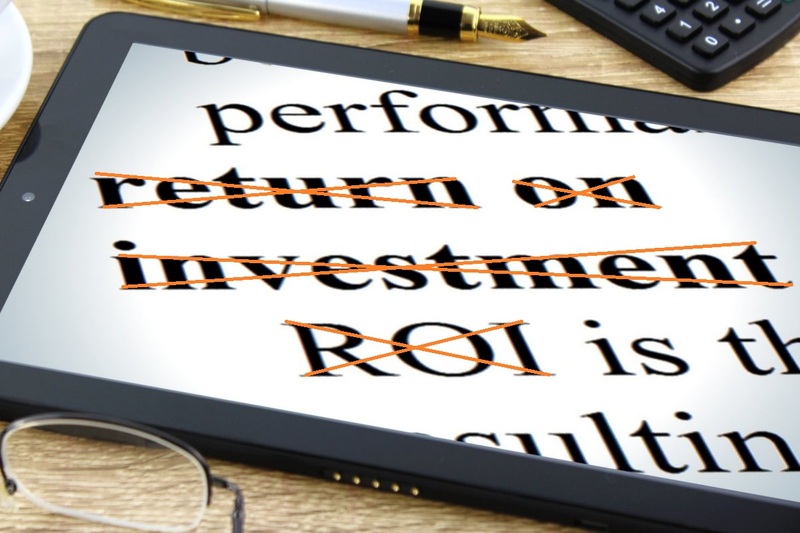 It is that the value of e-Learning can be measured as a return on investment (ROI). My contention, simply put, is that it can’t. Return on investment and e-learning? Now don’t get me wrong: e-Learning, in my book, is the bees’ knees for a whole host of reasons, many of which I’ve touted in other blogs here. It’s the way to go. But ROI is not (and never has been) the way to measure the value it adds. If you’re reading this and thinking I’m going out on a limb here, then statistically at least, you’re not wrong: Google ROI e-learning and you’ll get 2,450,000 results in .43 seconds. Two-and-a-half million search results surely can’t be wrong. And surely, then, there must be some connection between ROI and e-Learning. There is indeed. But it’s historical, not causative, and it’s based in a simple confusion. Rewind to the 1990s, when e-Learning was starting to make a splash. In those days, a lot of businesses had a physical academy or a training centre, and they would fly people in to take courses in your standard classroom setting. That meant considerable investments on a lot of fronts. And then along comes e-learning, and it almost sells itself because it’s so much less expensive. So, to be clear: we’re talking here about savings: doing the same or a better job for less. And at some point there was a bit of terminological confusion, and talk of savings became talk of ROI. And companies were indeed switching to e-Learning, so the ROI story seemed to be working. And if something works, you stick with it. a measure of the efficiency of an investment in yielding a return, expressed as a percentage over time. The first thing to say about this definition is that it has nothing to do with savings—with how much an investor might have had to invest in some other solution. The second thing is that, while ROI can be a form of value, there are other forms—and not all of them are so readily quantifiable. And this is the crux of the matter: e-Learning is a boon to companies in its own right (and not just because it’s less expensive than in-class learning): it adds considerable value—but not in a way that is immediately quantifiable, and certainly not on a dollar-for-dollar basis. Don’t try to link (e)Learning directly to extra revenue. It is not possible. The success of onboarding programs can be measured. It is one of the few points where a return of investment can be established. In our flexibilized labour market, companies will still want to invest in their people, but without naively pouring huge sums into centralized learning only to see employees move on after a couple of years. The decentralized, agile employee generated e-Learning courses can help them do just that. Employee-generated e-Learning is less expensive than in-class courses and than e-Learning courses that are produced by developers and instructional designers—and it’s a lot faster and more flexible. When a subject matter expert creates a course, not only his colleagues will benefit. He will achieve greater master of the subject matter they’re presenting—creation being the highest level of mastery in Bloom’s taxonomy. And that, in turn, creates decentralized pockets of enhanced expertise throughout an enterprise. Now this model is still a work in progress, and will need plenty of refinement. But for my money (and yours, too), sustainable, employee-generated e-Learning is the best way to keep the process of continual improvement humming along. Next What are your biggest Learning and Development challenges?